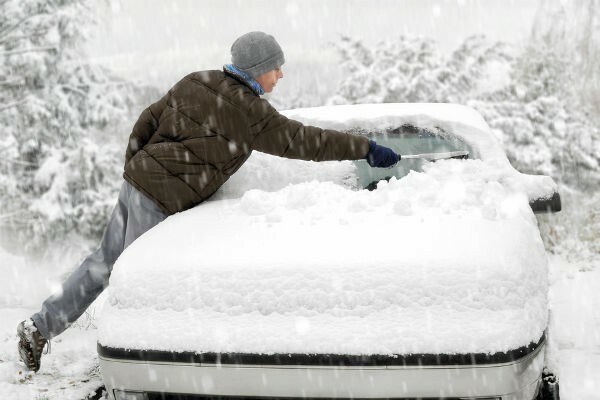 Have you ever wondered how people can see out of their vehicle after a snow storm when all they have done is carved out a small “window” in the windshield and have not bothered clearing off the remainder of the windshield, rear window or any of the door windows? For safe driving and the most efficient method of snow & ice removal from your vehicle, this article provides some great tips. Prior to the arrival of a storm there are a few things you can do to prepare for the strenuous job of cleaning off your car in the aftermath. First, lift your windshield wipers so they are not sitting against the windshield. This will prevent them from becoming “stuck” to the windshield and can protect them from damage. Also, make sure the windshield wipers are free of ice before using them to prevent them from scratching the windshield and to reduce the potential of damage to the wiper motor. Second, cover your car and windows with a tarp or pieces of cardboard. It is important to remember to remove the tarp/cardboard as soon as the snow/ice stops to prevent it from sticking to the car. Finally, you can spray your windshield and windows with a mixture of rubbing alcohol, vinegar and water to help prevent ice from adhering to the windshield making it easier to clear once the storm has passed. It is also important to ensure you have cleared the snow from the roof of your vehicle so when the snow and ice start melting it does not fly off the top of your vehicle into the path of the traffic behind you. Many states have initiated legislation where drivers can be fined for not clearing the snow off the roof, hopefully reducing the potential of accidents and injuries resulting from these “ice missiles”. Following the tips provided above should help make the laborious chore of cleaning off your vehicle a little easier, as well as helping to provide a safer driving experience. Spring cannot come soon enough!